There are a variety of materials, some common and some unique, that you can find scattered around the in-game world. Each of the three towns have their own special wild-grown items that you can only find in that town. Some of these foraged items can be used as toppings when cooking in your kitchen, and some of them are necessary for crafting certain Farm Circles from Ludus' Relacion shop. The wild items that can be used for cooking (herbs, berries, etc.) will have an associated Star Rank, which will increase naturally as the years go by in your game. Starting around year 7 you'll be able to find 5-star foraged items. 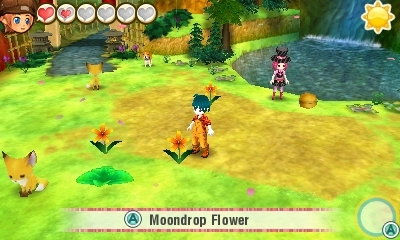 Other foraged items that aren't edible, such as flowers, will not have a star rank. The items you can find just laying around on the ground include branches, rocks, wild flowers, herbs, sea shells, and downy quills. Every few days you'll find new items to pick up for free. These items will change depending on the season you are in. A farm pet with the Finding Misc. job can collect Poison Mushroom for you. 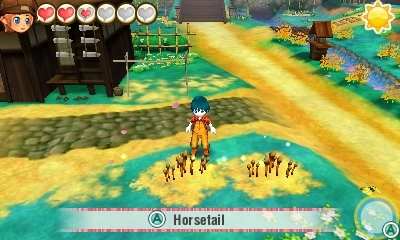 As you walk through the towns you'll come across bushes and small trees that have wild items for you to harvest. They don't belong to anyone specific, so feel free to pick the goods from the plants when you see them sparkling. The plants will regrow the harvested crops between 3 and 6 days from the last time you harvested. The same bushes may produce different types of pickable items depending on the season you are in. Most bushes will go dormant and not produce anything during Winter except for in warm South Lulukoko, where the Ocean Primrose and Beach Vitex will be harvestable all year long. Unlike some of the ground items, the bush and trees don't require you to reach a specific time in the game to produce their goods. You simply need to unlock the towns and they'll be available from that point forward. If you're trying to collect Giant Butterbur, keep an eye out for part-time jobs from Shizu. One of the extra rewards she gives you for doing the same job for her three time is Giant Butterbur, even if the foraged item is out of season.